People always want to know how to grill a steak properly. The grilling process I am about to describe is something I have experimented with for sometime. Bottom line is this. If you follow my instructions precisely, the end result will be a steak that has the smokiness of hickory but the texture of a perfectly grilled steak. The first step is a perfect piece of beef. In my opinion, the best cut of steak (and I have tried steaks of all cuts from all over the country) is the bone-in rib-eye. The bone adds more flavor than you realize, and the fat marbling in a rib-eye delivers richness and moistness that is unrivaled. Call your butcher and have him or her cut you some bone-in rib-eyes to 1 3/4 inches thickness. Yes, you heard me. Almost two inches. Trust me on this. Set up your Weber with indirect heat. The video below will show you pictures. I use hickory logs to hold the charcoal on the sides which also adds a smoky flavor. If you don't have hickory logs available, you can bunch the charcoal to the sides or use fences that you can buy. The key is to make sure the middle of the grill has no coals under it. Make sure you place hickory chips on the charcoal. This will provide the unique smoky flavor. You can season the steaks anyway you like. 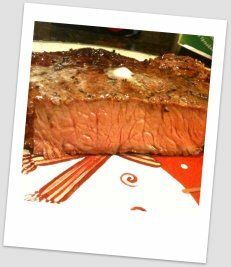 I sometimes use Fuzzy's Steak Seasoning, or Kosher salt and freshly cracked pepper works well too. Allow the steaks to come to room temperature. This will take 30 minutes or so. Place the seasoned steaks in the middle of the grill and place the lid on the grill with the vents open. Allow the steaks to smoke for 30 minutes. After 30 minutes, move the steaks directly over the coals. If the coals aren't hot enough, add a few fresh coals to get the heat up. Grill them now on both sides for 3 to 5 minutes until the steak reaches your desired serving temperature. Remember, the steaks have cooked for 30 minutes, so this step is to add texture, NOT to overcook the steaks. Bring the steaks and allow them to rest for ten minutes. This allows the juices in the steak to slow down. If you cut it too soon, all the moistness will come spilling out on your cutting board. A pat of butter on the top of each steak slowly melting on the surface adds to the presentation. Chill out. Did I say this ws health food? Do you have a question for Dave about this recipe? CLICK HERE and he will respond within 24 hours! Leave How To Grill a Steak and Return to BBQ My Way Homepage. 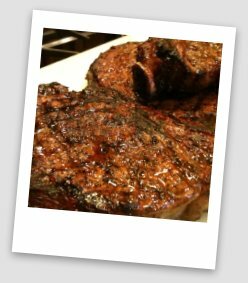 Leave How To Grill a Steak and Return to Beef Recipes.